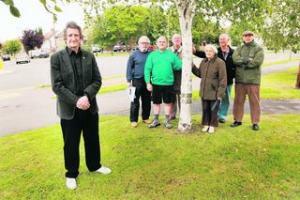 SUPERMARKET giant Tesco has put fears about the future of a Marston memorial tree to rest. Rumours were circulating that trees outside the old Friars pub would be cut down as part of the site’s imminent transformation into a Tesco store. One of the trees was planted on Armistice Day, 1950, to commemorate the people of Marston who died during the Second World War. Tesco spokesman Maxine Crawford said: “The trees are not going to be removed, but some lopping is definitely required. Planning permission was given earlier this year to turn the Old Marston Road pub into a Tesco Express shop, despite local opposition. There are several trees outside the pub, including the memorial tree, and they are on land controlled by the highway authority and outside Tesco’s ownership. Local resident Mick Haines collected more than 4,400 signatures on a petition against the store being given planning permission. Four trees were planted around Marston in 1950. One near Crotch Crescent was for those who died while serving in the Navy, with two more at Marston Road for the Army and the Air Force. The final tree was planted at the corner of Marston Road and Old Marston Road for the Home Services. Cromwell Close resident Josie Bridges, 86, lived in the area when they were planted. She said: “The trees were planted in memory of the forces. “I don’t know whether a lot of people know about them now, but I think the older people would be upset if they went. They bring back memories of the war. Marston city councillor Mary Clarkson said: “All trees need to be pruned and if it is done in the right way, it is good for them. She said a plaque should be installed to mark the trees’ history. Planning inspector Andrew Pykett granted permission for the store to go ahead in June. Despite opposition, he believed the effect of the store would be “limited”. CLAIMS the site of the Oxford Centre for Islamic Studies was once a pig farm have had “no bearing” on its delayed opening. Rumours the Marston Road centre was built on former pig farming land have been dismissed as an urban myth. 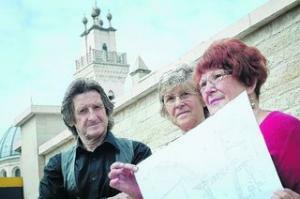 But residents, who claim to remember feeding pigs there, have now found a map they believe proves its existence. Pigs are considered as haram, or forbidden, in the Islamic faith, and eating pork or coming into contact with pigs is taboo. Richard Makepeace, registrar of the centre, said the delayed opening had no connection to the rumours, but was about ensuring the building was right. The centre was originally due to open in 2004, at a cost of £60m, but the date has been put back several times. Work stopped when trustees found they were £25m short of the funding needed. Contributions for the project have come from governments of Muslim countries, including Kuwait, Turkey, Malaysia and Saudi Arabia and the building is now set to open next year. Betty Fletcher, who now lives in Stockleys Road, Northway, said she remembers swinging on the farm’s gate when she was a little girl, looking at the pigs. Ms Fletcher, 69, added: “It wasn’t a myth. There was a piggery there and now we can prove it. “ Croft Road resident Mick Haines said he spent hours at the city’s libraries looking through old maps and reading about the site in Oxfordshire history books. He added: “It’s not a myth, and it’s not just people trying to make trouble. “The Ordnance Survey map, dated 1898, shows King’s Mill Farm, which definitely had a piggery as well as fruit trees. Mr Makepeace has previously said he believed the story was “an urban myth” and dismissed it as a “rumour”. He added: “We have no comment to make on these stories, true or false. A SUMMER FAIR has pitched up at a Marston park, for what is thought to be the first time in more than 30 years. It is believed the last fair to take place at the Croft Road Recreation ground was in 1977, the year Elvis died. The fair started on Thursday and will be open from 2pm until late today. Croft Road resident Mick Haines said it was a lovely surprise and a good thing for the community. He said: “It’s a great idea. We haven’t had a fair here for years. Fairground attractions included dodgems and merry-go-rounds, alongside high-powered rides for the more daring. 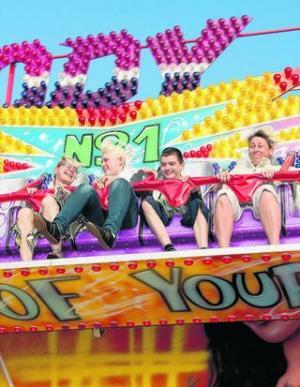 Among those enjoying this year’s fair was Inga Ramanauskaite, 16, of Marston, who went with her family. Admission costs £1 for adults and children and all rides cost £1 between 6pm and 7pm. I WRITE with regard to parking problems relating to the new Tesco store in Marston. Owing to the decision, Marston residents will now be affected by new intrusive parking measures to be installed at the request of Tesco in the service road opposite the new site in Marston Road. The residents will be affected by noise and nuisance from 7am-11pm. In addition to this, Highways has agreed to fell three healthy trees and move a telegraph pole without any consultation with the local residents. We would stress this is not a beneficial addition to an, up to now, quiet suburb. Where is the democracy in local planning? HERE we go again. Now there is a suggestion of putting a cemetery next to Hill View Farm, Marston. Along with Northway, we are already the two forgotten areas of the city. We have a sewage tank in Croft Road Recreation Ground, adjacent to the play area there and now they are proposing to put a cemetery in Marston. Does this mean living in Marston could be a dead area? Come on, councillors, can’t you see the light?